Now that Winter Olympic fever has gripped the global imagination, I can’t help but wonder why we don’t have more international birding competitions like the International Birding Rally in Peru. You’ve got to imagine that the only thing better than winning a gold medal would be getting the gold AND a bunch of lifers. Who can make this happen? A Cooper’s Hawk almost killed me this weekend. Well, “almost killed” may be modest exaggeration, but I happened to look out my window at the exact time the hawk was hurtling toward it. This magnificent raptor pulled up short, giving me an incredibly close full-frontal view, before winging to a distant perch. I’m just glad the hawk didn’t crash into the window and wreck both of us! Corey’s Best Bird of the Weekend was either of the two Red-necked Grebes spending their time at Connetquot State Park on Long Island. As the Great Lakes and other freshwater further north have frozen off there has been quite the exodus of waterbirds to the south. 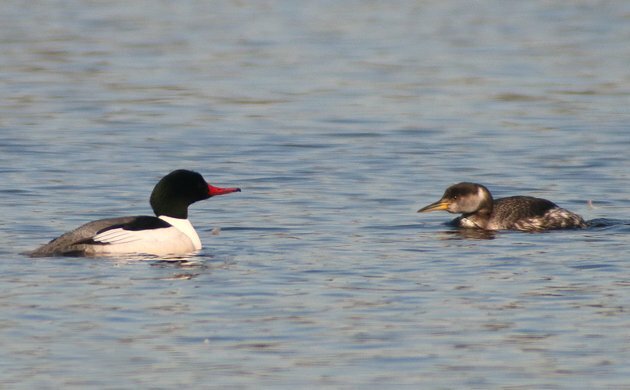 The bird in the picture above, with a Common Merganser, is surely part of that exodus. Lifer Barrow’s Goldeneye on one of the only tiny patches of open water on the whole east shore of Lake Michigan. Squalls of Snow Buntings, hundreds of them searching windswept fields for food. Horned Larks are with them and just a few Lapland Longspurs. To read more on my blog, click on my name above for stories about them and some recent owl encounters . Just like Peter above, Snow Bunting. Seems like everyone in Indiana was posting about them. I was more excited since it was a new county bird. And I wish this never ending CBC weather would end. A local birder, Bob, helped me to find a Wandering Tattler on a pier in San Francisco. Keel-billed Motmot in Cockscomb Basin, Belize. What a wonderful bird and a wonderful experience finally tracking it down. 9 miles of steep muddy trails and a half hour hunt to find the perched, calling bird! Where Are You Birding This Second Weekend of September 2010?